My Sicilian vacation can be summed up in three words: Food, Wine, Beach. From my experience, that’s all that matters there. Because when you’re not stuffing your face with food and wine, you’re swimming it off in the Mediterranean Sea. 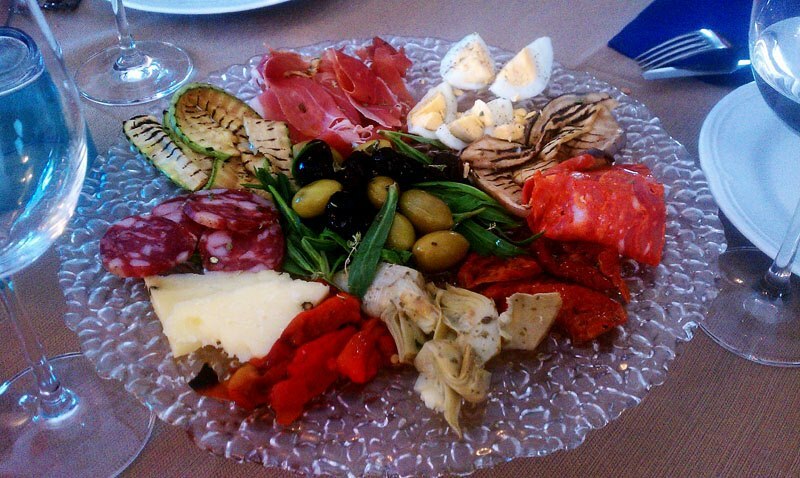 I was especially excited to dine in Sicily because it is where I have always dreamed of going and so many of my favorite Italian foods originate from here. 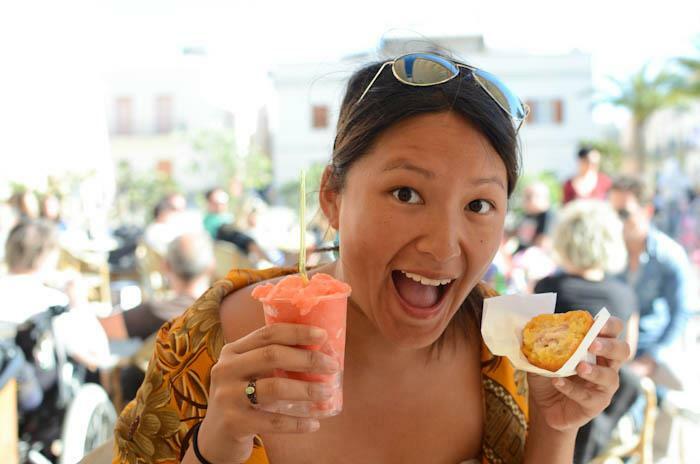 So here’s my list of my Sicilian food highlights. What I love about Sicilian cuisine is that while it is primarily traditionally Italian, because of the different culture occupancies in the area, there are some Spanish, Greek, and Tunisian influences that remain today. Maybe I’ve been in the countryside without anything other than traditional Italian food for too long, but whenever I see diversity in food, I get pretty excited. While I didn’t get to try everything…I did try quite a bit! Apologies again poor photo quality since my camera is broken, but Lisa was nice enough to lend me her camera at times. Oh yes, those shrimp are indeed raw, and yes we served them like that. 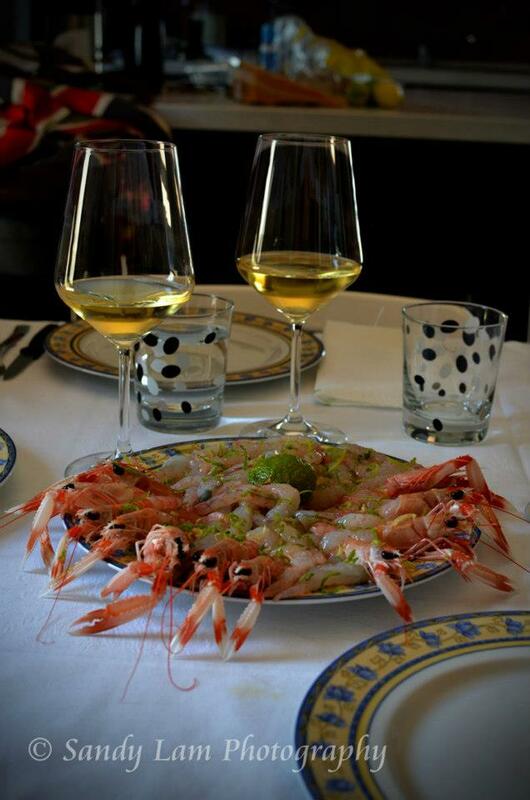 Being one giant island in the Mediterranean Sea, Sicily offers bountiful amounts of seafood. 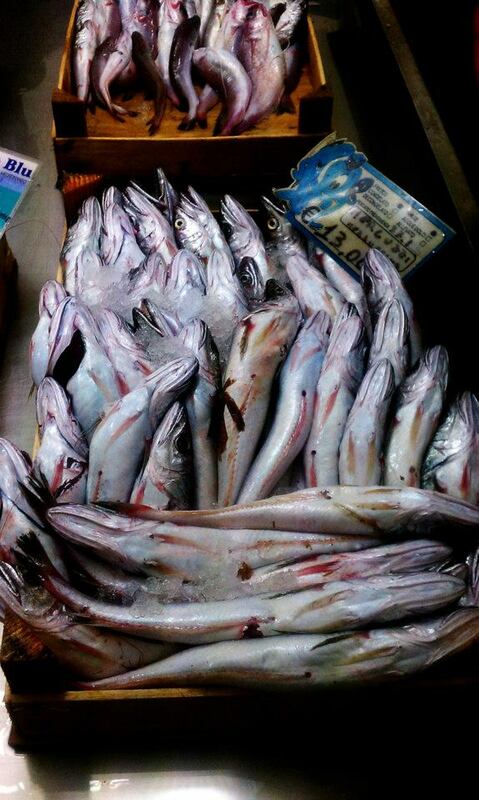 Sardines, tuna, sea bass, and swordfish are some of the more noteable fishes from around. Traditional fishing, especially for Tuna was the major part of Sicilian culture and history up until about the 1970’s or 1980’s. A “Tonnare” is a tuna fishery and while we drove by the largest one (located near Scopello), most have been abandoned or turned into historical museums. We even spent our last evening in Sicily in the small town of Mazara del Vallo, the oldest fishing harbor in all of Sicily. It was a beautiful sight to see old Sicilian fisherman and young ones working together on the rusted, smelly fishing boats. When our host Nino took us out in Marsala the very first day, we gathered up plenty of Sardines, shrimp, and Vopa (a small fish). 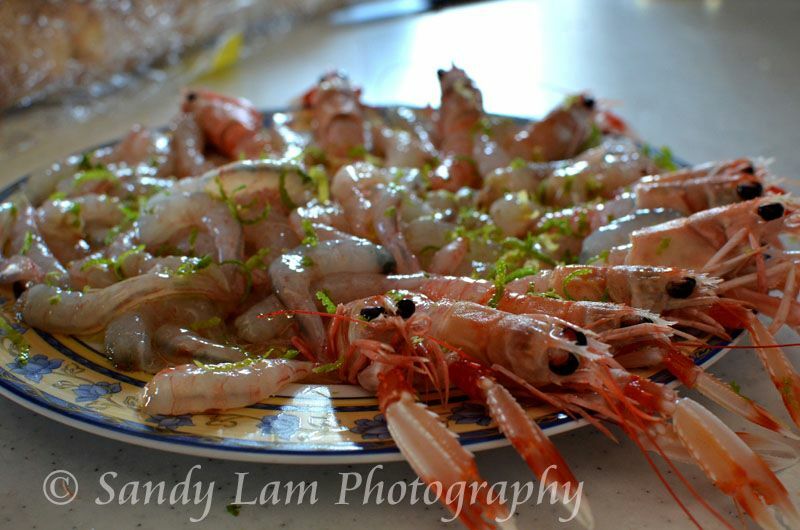 We prepared the shrimp by peeling them and setting them on a plate. All Nino did after that was drizzle some olive oil, picked a lemon from his lemon tree, grated the zest over, and a couple dashes of freshly ground black pepper. I don’t particularly favor raw seafood (though I do enjoy sushi), as I’m rather picky, but always up for trying new things. The shirmp was surprisingly pretty tasty, though I preferred the mini lobster looking ones to the regular shrimp, which reminded me more of a really cold loogie texture wise. 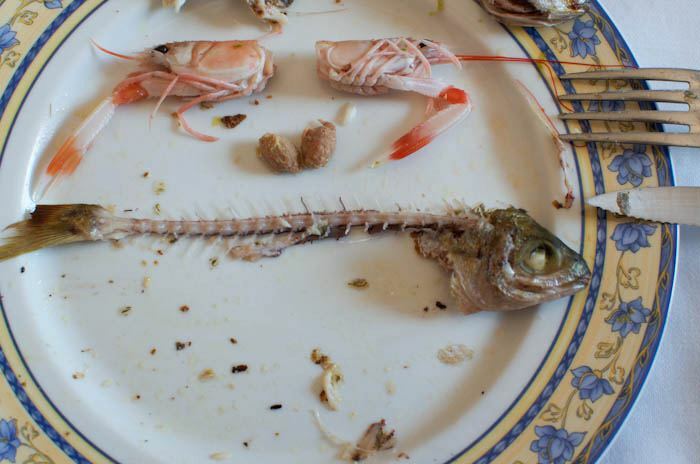 The fish were grilled and lightly seasoned with some salt but nothing beyond that. I did not particularly enjoy the Vopa very much because it didn’t seem to have enough “meat” on it for me and was rather bland in flavor. 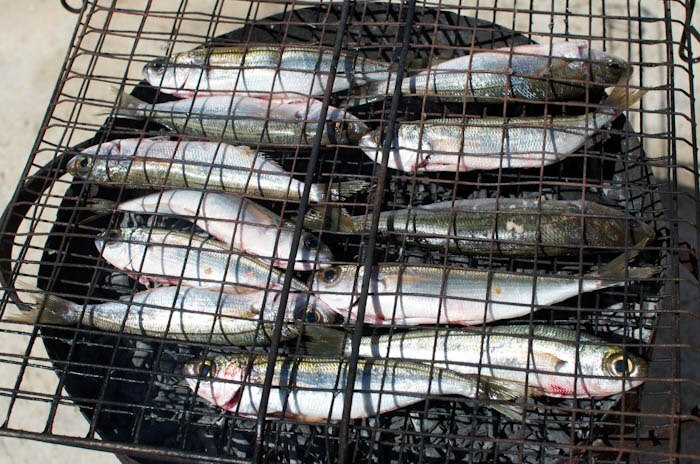 The second course of grilled fish consisted of the Sardines, which I found surprisingly tasty. I don’t think I’ve ever had sardines. When I think of sardines I think of anchovies. Which just sounds too salty for me. But all was good here! Of course, what Italian meal could be served without some great Italian wine? We tried a white wine from Rocca Della Campane (2007) made with mostly Carricante grapes (a variety originating in Sicily around Mount Etna). I really like this as the wine was not particularly strong in flavor or aroma, it was just right with the fish. Pleasantly fruity in smell with light acidity. The wine flavor remained strong enough despite the smokey flavors of the grilled fish. Next up, is probably the most popular dish from Sicily: Arancini (pronounced “air-an-chi-ney”). The first time I ever saw one was through the window of a small bakery window in the streets of Venice. When I saw the round ball with all it’s deep fried bread crumb covered glory, I immediately asked him what it was. He told me it was a popular Sicilian dish, and that I should wait for my first Arancini experience in Sicily for the “best effect”. 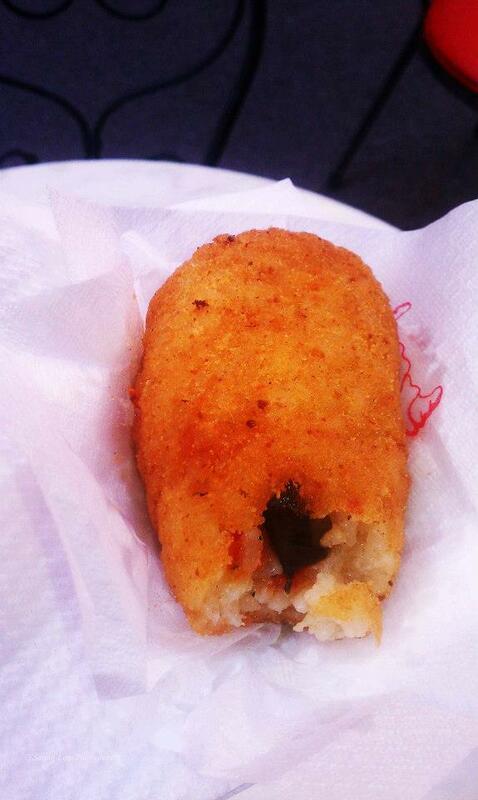 So my mission in Sicily was to eat an arancini every chance I got. Which I definitely did. 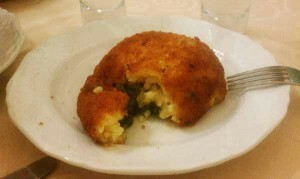 Unfortunately, the BEST arancini I had was in Scopello, and I didn’t even take a picture of it. An arancini is basically made with seasoned rice balls, stuffed with different fillings. Ragu and mozzerella/proscuitto seemed to be the most common fillings, but there was even eggplant, spinach, all sorts of goodness. It’s coated in breadcrumbs and usually deep fried, but sometimes baked and generally either round or oval. I love these because 1. They’re really good 2. Filling as a snack or meal (get two) 3.Cheap. The only downfall to these gluttonous balls of comfort is that there is no way you can tell if the arancini is good or not. They pretty much all look the same and it’s a little bit of a gamble. For the most part you can’t go wrong, but I did have a couple that weren’t very good. The rice was too sticky or stale, or the arancini itself was still cold or too greasy (yes…Americans CAN think things are too greasy…SOMETIMES). I grabbed an arancini recipe so look forward to that blog post whenever I get home! I LOVE LOVE LOVE Granitas. They are my greatest weakness. More than gelato believe it or not. But I am MUCH picker about my granitas than my gelato. Once you have the good stuff, it’s hard to settle for anything else mediocre. A granita is basically a mix between Italian shaved ice and sorbet. My first great granita experience was actually in Vasto, but it’s the only place on mainland Italy I’ve found a granita comparable to the Sicilian ones. The first time I saw it on a menu I was picturing some fruity mexican mixed drink with shaved ice. Turns out they’re closer to a sorbet than shaved ice. The good places, keep their granita is the same kind way they keep their gelato, in a container in the freezer. If you see something that looks like a slushy machine from the quickie mart? Stay away. Those ones will taste exactly like what they look like. Blended ice with high-fructose corn syrup mixed in. A real granita is made with fresh fruit. And to me, there’s no better flavor than strawberry, but limone (lemon) is also a good second. Lemon flavors in Sicily are out of this world. Speaking of which…. 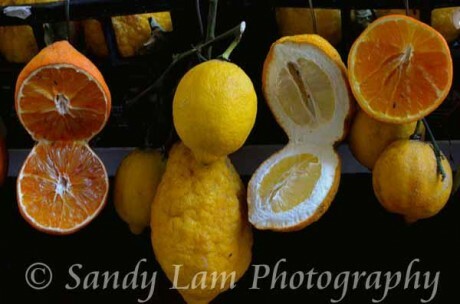 Sicily’s rich red soils are great not just for grapes but lemons and oranges too. I’ll never forget my first sicilian orange. It was just a regular “bionde commune” (blonde orange), not even a sampling of the infamous blood oranges found there. But it was the juciest, sweetest orange i’ve ever had. It was impossible to peel without making a sloppy mess of yourself. And every single orange I had after was just the same. It was like having your perfect orange every single time. 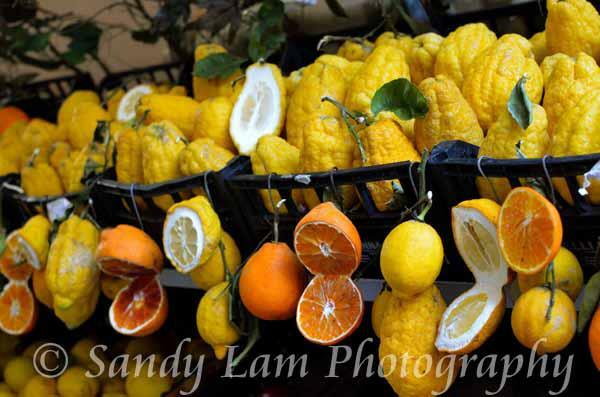 There are lemon trees a plenty in Sicily, and while I am not much of a lemon fan (other than to zest my foods), there’s something about these lemons. They’re not as tart as I’m used to. Amazingly refreshing and perfect for cooling off during a hot Sicilian night. 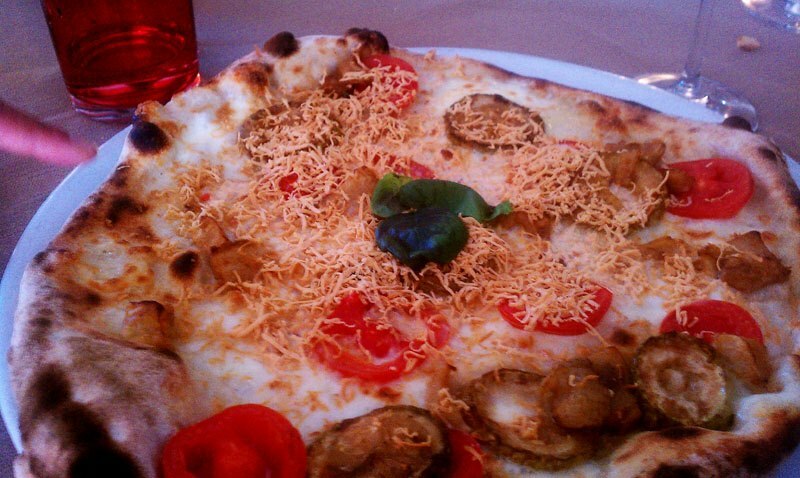 Even though Sicily is not known for their pizzas at all, don’t sell yourself short. I only had pizza a few times in Italy, but each time they were AMAZING! 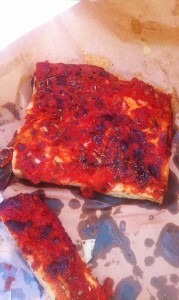 Crusts and sauce quality were superb! One disappointing thing about Sicily is the lack of street food. The only place in Marsala specialized in Panelle, a fried piece of flattened mixture of flour and chickpeas. Topped with a dash of salt and pepper, they can be eaten alone, or more commonly as a side in a sandwich. 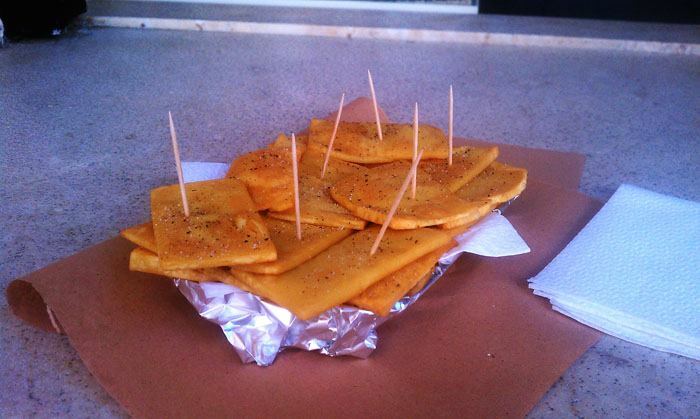 I really enjoyed these addictive snacks and definitely worth a try if you come across some. 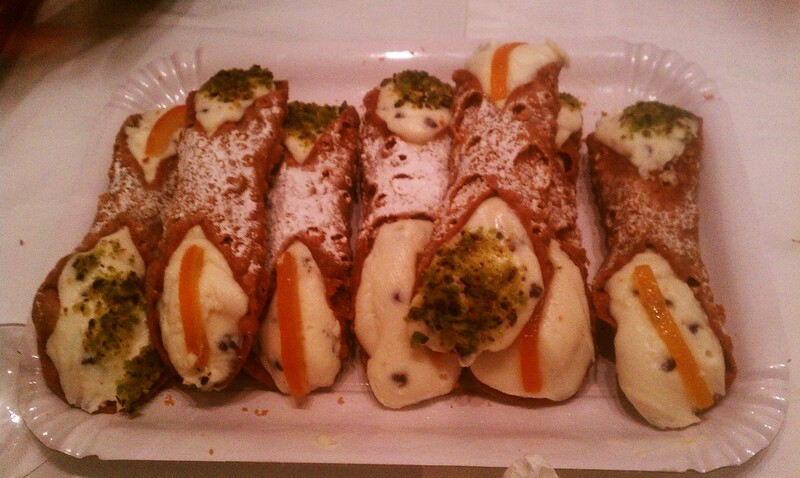 Sicilians LOVE their sweets. Afterall, the infamous Marsala is a sweet very very sweet wine. We had several desserts in Sicily. The first of which was an all time favorite, Gelato. 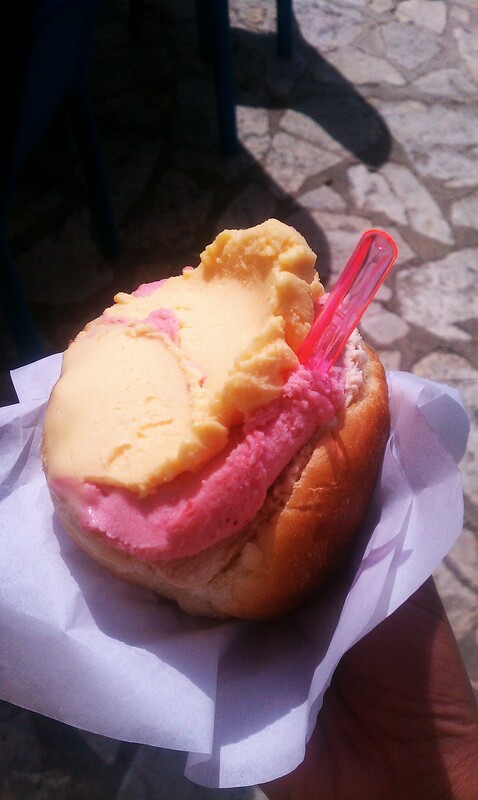 But gelato is Sicily isn’t just served in a cup or a cone, the first time I saw someone eating gelato in Sicily it was in a HUGE fluffy brioche. When I saw the man turn around with a full stuffed brioche, my mouth literally dropped open. I could barely get out, “Mas, che cose?” when he saw me gawking he nodded his head, pointed to his brioche and said, “Si, gelato in una brioche!” And made yummy noises. I was stilled standing there mouth wide open and said, “I MUST have this. My mind was blown. In my year in Italy, I’ve never seen gelato eaten in such a way. Nino took all of our orders and paid for them and I waited eagerly to tell the man behind the counter my flavors. I was last one to go, and when I started with, “Per me, una brioche…” The very grumpy man behind the counter looked at my ticket and said, “Non brioche. Solo coni.” (No brioche, only cones). I felt so disheartened I didn’t know what to say but made a sad face. I was going to try to argue but the man quickly interupted me and asked me what I wanted. Very rudely by the way. When I came back to the table everyone was wondering what happened to my brioche and I could only meekly say, “He wouldn’t give me my brioche…” Nino went up to check the ticket, which indeed had my brioche on it, but at that point I didn’t want to cause a scene as the place was PACKED with people. So I was promised to get a brioche the next day. The next day I eagerly awaited my gelato in a brioche. We were in Scopello that day, and the gelateria I went to wasn’t the greatest, but they had brioches and I was excited. Unfortunately…it wasn’t has exciting as I thought it would be. It was quite heavy, I almost didn’t finish. I also felt like I was just eating soggy bread. The brioche didn’t really add much to the gelato, so I still prefer my gelato in a cup. Maybe it was the quality of the brioche I had, but I don’t think it’s that likely. 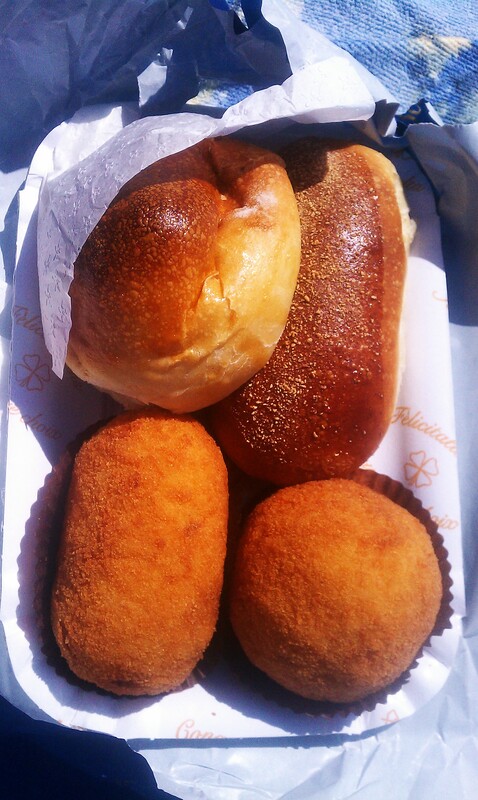 Next to an arancini, no visit to Sicily would be complete without an freshly made canoli. It’s basically a taco shaped deep fried pastry stuffed with sweetened ricotta topped with crushed pistachio or orange rinds. It was a bit too sweet for my taste, and there was an absurd amount of ricotta in ours. I can’t imagine eating a whole one! I just had half of one. It was incredibly rich. It’s a similar feeling to eating cheesecake. I’m not a huge fan of cheesecake because of the richness of it, and I felt the same about Canoli. A little is just fine, but anymore and I’ll be throwing it all up soon. It’s reccomended that your canoli be made as freshly as possibly. Like if you can’t see them stuffing the canoli in front of you, it shouldn’t have been sitting there for more than 15 minutes. Our nights in Marsala always ended with a new bottle of Marsala. Marsala wine is fortified and usually made with Grillo and Catarotto grapes. Generally around the 17% alcohol range, very sweet and very amber in color, these dessert wines are much tastier without a dessert in my opinion. Some would argue differently. But while passito is usually accompanied with dessert cakes and compliment each other, Marsala should just be served on it’s own. Especially in Sicily when all their desserts tend to be very sweet and very rich. 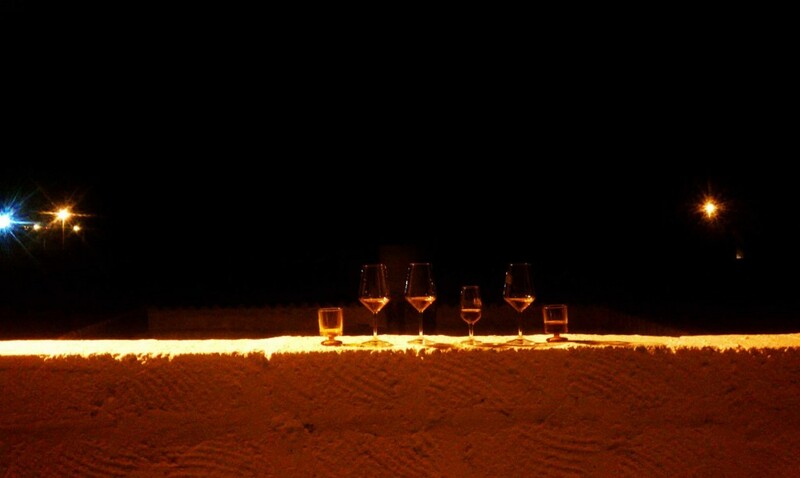 It makes a great night cap, which we all shared on the roof in Marsala gazing at the rising moon. A perfect way to end a day of exploration and a way to end our holiday in Sicily.